Doesn’t everybody use the internet? 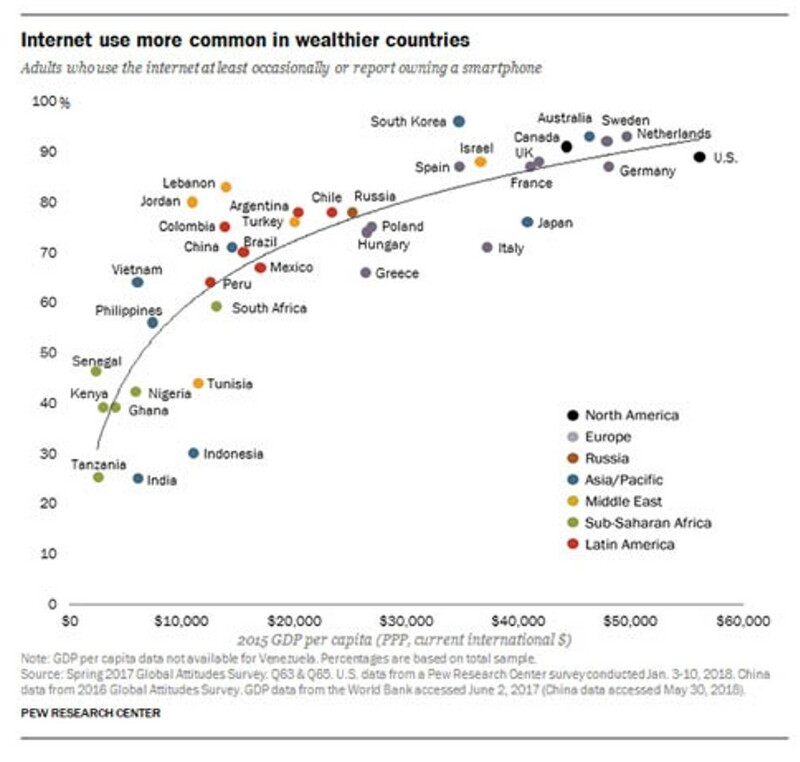 Actually, if you look at internet usage across the global economy, you find that the citizens of wealthier nations like Sweden, Australia, Canada and the U.S. are far more likely to have internet access than less wealthy nations like Tanzania, Indonesia and India. You can see from the graph that GDP per capita (getting higher as you move left to right) is a good (though not perfect) predictor of internet use. Some of the most interesting anomalies are South Korea (high but not the highest per capita income, but the highest internet usage, with nearly 100% of citizens having access), and Italy (wealthier than South Korea yet only about 70% of its citizens use the internet). Japan and the U.S. fall below the trendline, while Lebanon and Jordan, Israel and Argentina are above it. The second graph shows the leaders and laggards in internet usage, globally, in a handier format. Here, income is stripped out, and you see the raw percentages of adults in each country who use the internet at least occasionally, or who own a smartphone. The U.S. is high on the list, but falls behind five other countries, while Tanzania, India and Indonesia all report 30% or lower overall usage.